Limited only to 6000 bottles! Gentle camphor and heather smoke on the first sniff. Delving deeper we have sweet, sugary vanilla bonbons, some sugar coated almonds, American hard gums (the white ones). All the time interspersed with puffs of smoke. Heather floral. Some nice grassy moss. Fields drying out in summer sun. A little time and more jelly sweets, jelly beans and babies! Pine wood, almost Christmas trees. There is an awful lot going on. 10 mins in the glass and we have even more confectionary, sweetie shop dusting sugar in the air. There are touches of sweet glazed BBQ ribs in the background now. This is a very deep, richly fulfilling nose. Heavenly. Initially oak bitter notes on arrival, then some ABV heat, subsiding quickly. Then the fun begins. The mouthfeel – oily, thick, viscous, very coating. Smokey, oily flavours surround the mouth. Sweetness comes through with richly intense vanilla cream. Creme brûlée. Biscuity malt. Then some smoke, and earthy elements, like inhaling a smouldering posy of heather and field flowers but most of that smoke staying on the tongue. There are touches of citrus juices in the background. A thoroughly engaging palate here, quite straightforward, but very rich and moreish. Must save some for water! A medium-long length sweet and turning drier finish. Icing sugar filling the senses. Then remaking oaky layers, kindling smoke, pine wood. Akin to chewing on a familiar pencil. Whiffs of smoke remain as a memory, with a touch of lemon oil. A few drops added to what I have left (it seems to sip itself). The nose now has more floral to the smokiness. More intense, sweeter smoke. The palate has more of a green fruits thing going on amongst the oaky elements, and some added liquorice and herbal notes. 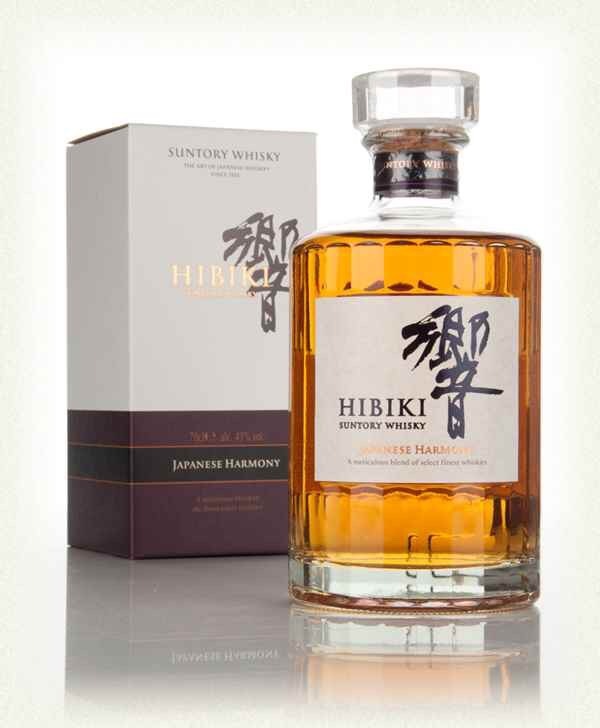 The finish retains and amplifies the herbal notes now, and is all together more rounded and intensive an experience. Hmmm. With or without? I like both versions, probably undiluted slightly more, but if you like your dram with more of a herbal edge then diluted it is. It’s definitely one to safely experiment with water and the outcome is very enjoyable. Added a touch more water (it takes it well), now we have some more fruitiness coming forward with dried pineapple and mango up front. That has transposed to the palate also, juicy fruitiness now of a tropical variety. The finish is still full of luscious oak and smokey joys. This is a tremendous, complex, evolving, and most importantly enjoyable whisky. Loving every drop. Thanks so much to Tomatin for providing the sample. Bit funky and odd, but in a compelling way. There’s lots of direct sherry influence. Rum and raisin, Christmas cake, cloves and plums. In addition, you have an overlaying of bitter oranges, unripe. Zest, peel and pith. Quite intriguing and odd for whisky. There obvious youth in the heat on the palate. But we also have an awful lot of sherry flavours going on. It’s big, not subtle in any way. Cloves, plums, big plump raisins and sultanas. Christmas cake galore. The addition of the oranges isn’t as evident on the palate as it is on the nose, although there is a little more orange juice than you would normally experience on a sherry monster, plus some cherry juice and stones. Medium-long length finish. All the tale tale signs of a sherry monster, drying cloves and Christmas spices, with some drying fruit elements, cherry, sultana, plums. But oh, here’s the oranges again, some orange juice and like chewing on the remains of an already juiced orange (in a good way – sweet, not bitter). A good drop added. The nose is now more spice intensive. Lots of cloves and Christmassy spices and cinnamon. Some sweet pepper, and a little raw dusty spiciness. Like having your head in a spice container. The orange notes are quite diminished by the dilution. The palate is creamier now, more viscous texture. More accessible thanks to the reduction of the heat, still lots of sherry content, but the addition of some of this creamy vanilla coming through. The finish returns to some slight orange elements alongside the creaminess, and some spice box dust. Very different. It’s an odd one, but in my opinion a good one. I really enjoy it, and pleased I got a spare bottle to enjoy later in life. This batch has already sold out, but there is more to come as far as I know. There was a lot of controversy over this addition of orange bits to a sherry cask to help season it, but you know what, that’s innovation. 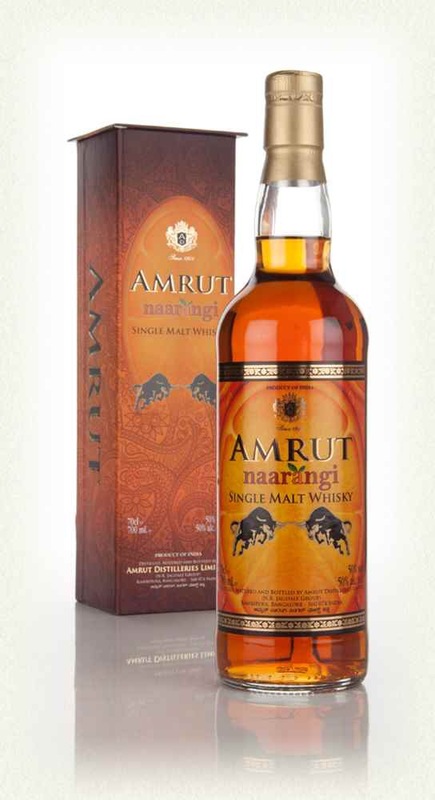 You have to try something different now and again, and I like the fact that Amrut can and will do something a tad different to see how things turn out! Good on them! Very fruity from the first pour. Lots of ripe apples, oranges and bananas, a real fruit bowl of a whisky. There’s a level of waxiness to these fruits, suggesting some age despite the non-age-statement nature of this whisky. There is some vanilla cream. Buttered popcorn, presumably from the corn whisky element of this blend. Light pepper and cinnamon bring the spice portion of the nose, with an overlying creaminess. Some pleasant, gentle, alcohol soaked oak is present with added time in the glass. Lovely remarkable balance to this whisky. No flavour outshines another. We have loads of fruit, in the form of oranges, banana, some light ripe cherry. Lots of creamy vanilla, with touches of pepper and all spice. The mouthfeel is quite oily and coating. We have lots of thick honey and Creme brûlée. It’s a luscious sweetness, with a touch of oak influence added in. Gentle fading for a medium length. The boiled fruit mix fades slowly, with a touch of oak spice providing a little heat in the mouth. Light oak remains at the very end with some cherry stones. Warming and moreish. Added the smallest drop, because quite frankly, it doesn’t need it. The nose has become lighter. More oak and the fruit has become more citrus focused, lemon sherbert. The palate has less oiliness now, it’s still quite flavoursome, but there is something missing with the dilution. The finish is very juicy, concentrating on the new, lighter citrus elements. Personally I prefer this one undiluted, but it does have some merits in trying with a drop of water. It’s all personal taste. Thanks so much to Suntory for providing the sample. This is an awesome idea, and it caught my attention as soon as I learnt of its impending release. A pack of 2 35cl bottles of vatted single malt from the following years, 1973, 1977, 1988, 1991, 2002 & 2006. One of the bottles contains whisky only matured in ex-bourbon casks, the other from ex-sherry casks. The perfect side by side comparison, showing how the different oak types will effect the spirit therein. 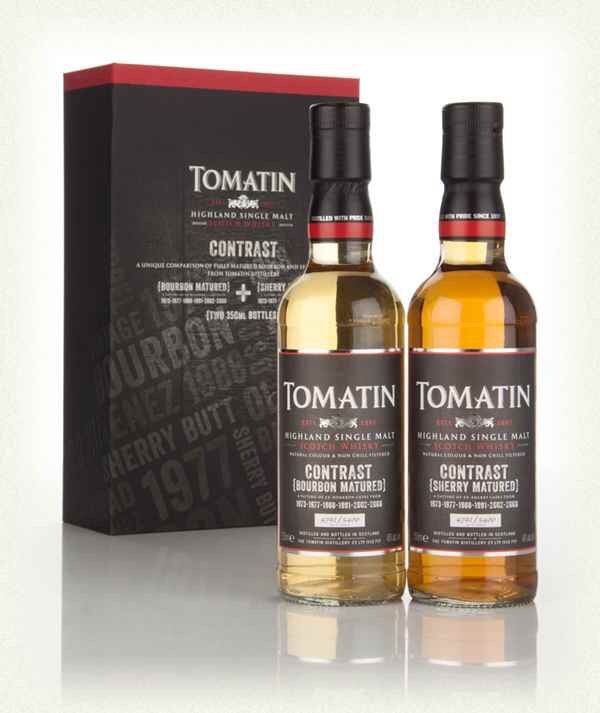 Limited to only 5,400 sets, so if you like Tomatin and fancy your own side by side experiments be quick with this purchase. Lots of tropical fruits on first pour. Waxy lemons. Juicy pineapple. Quite confectionary, pineapple cube territory. Powdered sugar sweetness. Vanilla cake mix. Mild oak spices. A little time in the glass and more fruit comes forward. Oranges, bright and ripe, more fruity boiled sweet greatness. It’s a monster of a fruit bowl. Ooo, that’s tasty. Lots of fruit. Some nice waxiness to the mouth filling texture. Apple, orange, pineapple, pear juices, with some watery syrup. This is a fruit salad of some finest quality. There’s some nice barley sugar sweetness in the development which goes very well with the mouthfeel, giving a rich caramel feel on the tongue. A touch of chocolate is experienced also. Dusty sugar sweetness and toffee remains for a medium-long length, with a gentle remnant of the fruit bowl slowly fading away. A touch of oak dryness at the very end. But more sips demanded! Just 2 small drops. This is perfect as is. Shouldn’t have done it. The nose is much lighter, only mild caramel and no great fruit talking. The palate is still flavoursome, but there is less of an event here now (I’m wondering if going between the two has weakened the experience of the bourbon cask or it’s the water?). The finish is still fruit and lovely, but I would not water this one at all in the future. Juicy dark fruits. Rich fruitcake. Plump sultanas. Rum and raisin. Cloves and Christmas ices. Glacé cherries. These flavours suggest sherry monster, but it’s more delicate than that and with time we have more rich toffee, chocolate and caramel. Confectionary again as with the bourbon cask, but this time more chocolate confectionary rather than old fashioned sweets. Oh my, that is richly delicious. Lots of thick toffee, cherry chocolate. Very chewy with again a beautifully coating mouthfeel. Second taste and all the chocolate, toffee and caramel comes about in droves. It’s a caramel chocolate bar of Cadbury proportion. Not heavy on the sherry concentration, although in the development we get more of a nutty note reminiscent of Oloroso maturation, some nice roasted hazelnuts going on. A spicy end to things, cloves and some mild cumin, sultanas are making their appearance now, and the sherry is more evident after the swallow. Some mild fruit cake, and again slowly fading chocolate and toffee confectionary. Some dusty oak at the very finish. Tiny drop. Don’t want to spoil things. Oh bugger. As with the bourbon cask this has not done any favours. The nose weakened. The palate still very lovely, but missing the body and richness previously experienced. The finish has a bit of a weakness now. Dammit. Don’t water it people, enjoy at its intended strength. Bloody lovely. A fantastic set, an educational experience (good excuse to get it past the other half etc!) and thoroughly quality in the bottle. 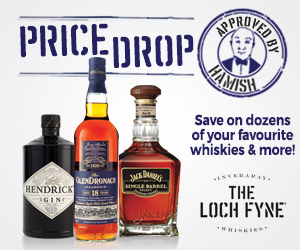 Personally, I would not go anywhere near water with these whiskies. DO NOT DO IT…please. Which one is best. Not saying, horses for courses and depends on how you feel. They are both special, and the spirit shines as does the quality of the casks, not overexerting the spirit. I guess these are mostly if not all are refill casks. Just a thought. 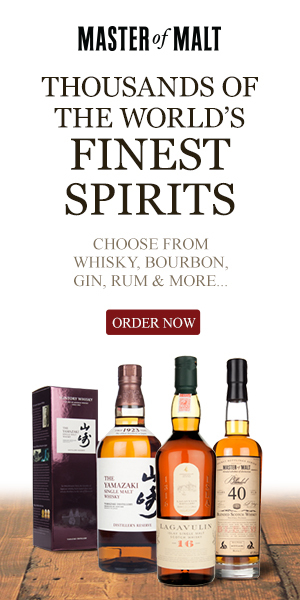 I wonder if other distilleries will take note and follow suit with such sets? Biiiiig time Islay nose. Pork crackling roasting on a BBQ. Bacon butties, with fatty, burnt to a crisp bacon and BBQ sauce. Fields covered in freshly cut grass drying out on a hot summers day. Heather in the background. Some liquorice sticks. Quite a bit of herbal in this Octomore, it’s reminding me of iodised throat tablets. A touch of TCP. There’s a large quantity of meatiness. Already well picked up upon in the trademark BBQ pork products, but there is also some roast chicken, speared with rosemary, stuffed with fennel and baked till crispy. In the deep and distant background, and with added time there is some honey sweetness glaze and maybe a hint of red apples and berries. 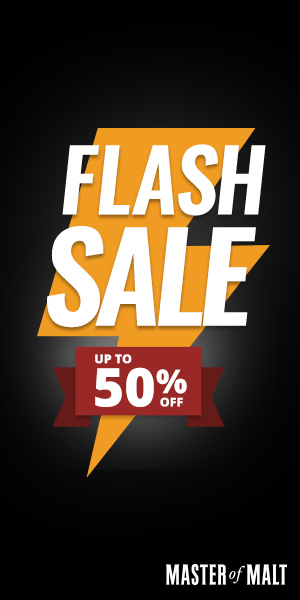 Wow…bang…zoom. Hold on. Gotta rethink this and come back, lots of complexity to put down in one sip (or it’s an excuse for several sips. :)). This is a mind overload of intensity. Ok, third attempt. Arrival is sweet smoke bonfire explosives, then boom, the ABV takes over for a bit, settles and development goes to smokey fruit. Lots of red fruits, jam, summer orchard berry pie filling. Raspberry, blackberry, strawberry, stewed red apples. Loads of bellowing smoke. A fire of some magnificence, with cigarette ash, heather fields ablaze, liquorice roots added, some various herbs and spices. Vicious delicious. The fruity ash notes stick around for a very long time. Some malted barley lingers in the back of the throat with all the smoke intensity. After about 30 seconds or more things start to calm and I’m left with strawberry/blackberry fruit roll (those concentrated jammy fruit chew/sweets made to look like health food) and a puff on a cigarette! Adding a wee dollop of water. The smoke on the nose has gone more floral and heathery now, there is slightly more access to the fruit elements, but they truly reign in in the flavour as the palate has become very intensely fruity, there is still the heavy peat smoke lingering, but the fruit is in more control, and luscious for it, paired up with the Octomore oiliness this is truly an experience and a half. The finish retains more smoke now, we still have the fruit, but the peat fires and smoke are big in this diluted finish. Another Octomore experience. That’s the thing about Octomore, it truly is an experience. And all of them are so very very fulfilling and adventurous. I said at the beginning I love Octomore, nothing has changed with this bottling, it’s fantastic stuff. Octomore is quite the marmite of a dram for most. 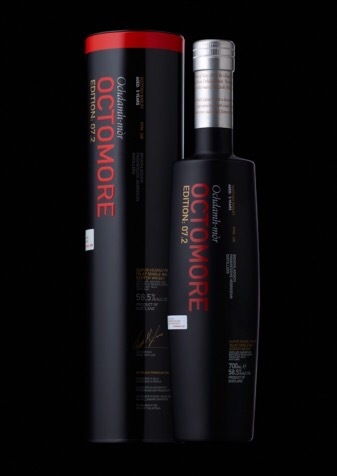 For me, I love marmite, but I bloody love Octomore more. Thanks so much to Bruichladdich for providing the sample. 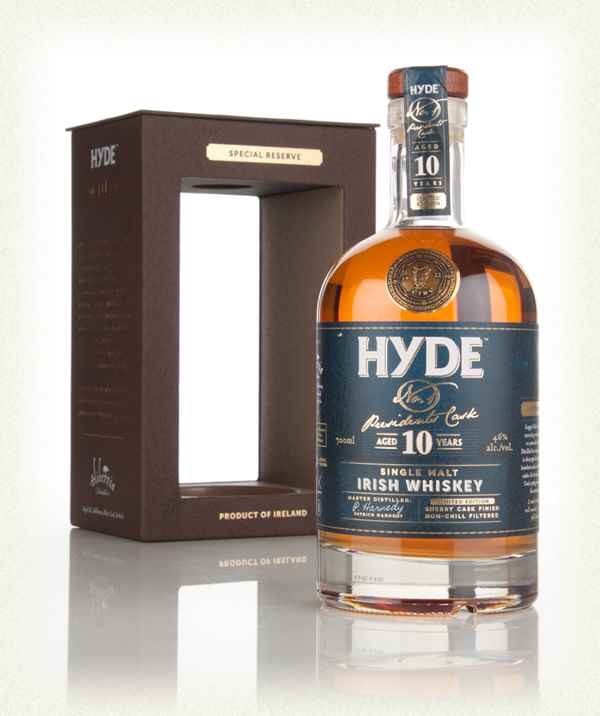 A new distillery for me, Hyde 10 year old is made in west Cork, Ireland. 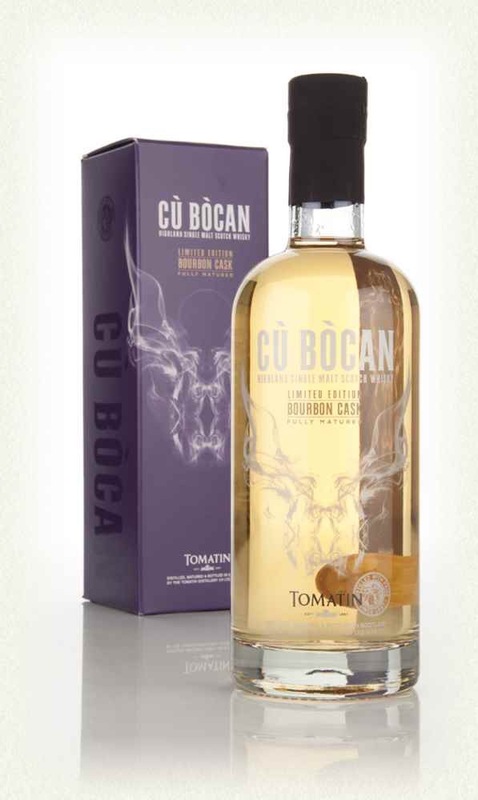 Matured initially in first fill ex-bourbon casks and finished in vintage sherry casks. It’s quite the limited production, with only 5,000 bottles produced in this latest run. 100% malted Irish barley, non-chill filtered and at 46%. So it all sounds very interesting right from the off. On first pour this is a very fruity, rich, complex nose. Lots of honey sweetness, and soft fruit, peaches, overripe apple, banana, all mushed up for a pie. There’s a background of light spices, pepper and a tiny hint of clove. With some time there’s some pine needle wood aromas, touches of wood glue. Vanilla is more pronounced now with bourbon influences coming forward. After sitting it down for a few minutes and returning we now have more banana, banana foam sweeties and candy cigarettes. (Hadn’t thought of those in years, how politically incorrect my sweet based youth was compared to nowadays. Lol). I’m getting more of a cocoa powder note after a few more minutes. Very complex and changing with lots of aromas within. Immediately sweet, lots of thick honey sweetness. A slight bite of ABV heat, but for no time, followed by lots more chewy sweet treats. There’s a lovely coating mouthfeel, demanding to be chewed. Toffee, boiled sweets, jelly tots, blackberry/raspberry jellies. It’s quite the sweet shop dram. It quietens down in the development, some chocolate, soft fruit (apples, peaches, apricot) pie mix with creamy custard and a hint of spearmint. With more time the palate only gets more thicker and jammy, really flavoursome stuff. The spearmint continues into the finish, with some spicy, peppery oak nips in the finish, lots of juicy fruit jam. At the very end we get some aftermath of sucking on boiled fruit sweets, complete with the sugar coating. Warming in the chest and just plain delicious. Added only a few drops as I think this dram is great at 46%. The nose is now more fruit concentrated, with some dustiness in the form of powdered sugar. The palate is also more about the fruit, it less intensive. Bubblegum elements are come through, old fashioned Anglo bubblegum! More banana now and less of the apples. Diluted this dram is very easy to drink, no harshness, no burn, just fruity goodness. The finish is again, very very fruity, sweet honey with sugar on top. Lush. A sweet tooth’s dram without a shadow of a doubt. This is a jar brimmed full of old fashioned sweets! Very much the desert whisky, or dieters whisky! This has a lot of sweet treats in the nose and palate, enough to bring the nostalgia of old sweet shops and long forgotten sweet delights of childhood back (as it did in me) to memory. 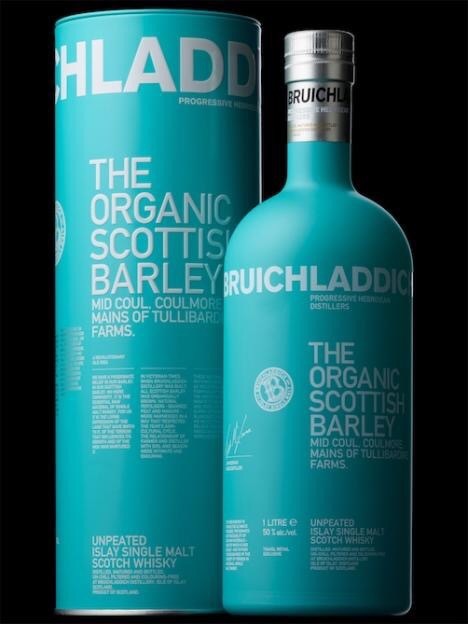 Personally, I thoroughly enjoyed this (it’s on my whisky wants list) and think it would make for a great session dram to sip alongside some chocolate treats! Thanks so much to Hyde for providing the sample. ~£54.00 (70cl) From Travel Retail or from here! Dusty hay bales strikes me initially after the first pour. With a little time to settle we have more barley sugar coming forward. Citrus notes take more of a foreground appearance in the form of lemons and tangerines. Fresh, but at the same time delicate and refreshing. Light honey accompanies some additional oats. Porridge like, with sweet honey and fruit. Lovely stuff. Tarty lemon citrus arrival. Quickly develops to thick barley sugar sweetness, thick honey with some lemon curd citrus coming into play. Some hay is present and a touch of herbal, with some aniseed. The mouthfeel is very viscous and coating. This is a whisky that tastes older than its years, for 5-6 years old it really has matured well and tastes beautiful. Medium length, spicy and sweet. Aniseed sticks around, well merged within a honey coating, and some lemon sweetness. This is honey and lemon throat sweets in a glass. Few drops added. The nose is now most complex, with added floral honeysuckle and herbal intensities, some added oak and a migration of the aniseed from the palate to the nose. The palate is just glorious, loads of vibrant citrus fruit juices, sweet now from the start, with a little tartiness coming middle of the development and quickly jumping back to creamy and sweet barley sugars again. The finish remains with honey and lemon glory. Beautiful whisky right here. This is a breakfast dram for the masses. Gorgeous stuff, so enjoyable, moreish, easy drinking, and also a very suitable summer dram. Creamy, barley rich on first pour. A wee whiff of smoke. Rich vanilla, ice cream like in intensity. Buttery malt. Simplistic, but with an obvious air of high quality. In time we have some additional citrus elements merging with the barley. Now a lemon cream biscuit characteristic. The higher than usual ABV carries so much flavour through. A wonderfully thick mouthfeel. So very sweet, creamy, buttery and velvety textured. 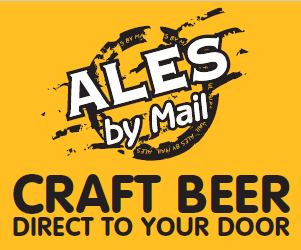 Light sweet lemon citrus, with buckets of honey and vanilla maltiness. Where Bere Barley had the honey and lemon intensity, this Organic Barley has more of a creamy, relaxing experience, highly sip-able. Lots of Creme brûlée, and a light, runny toffee note going through the development. There is a little bit of a warming bite from its youth, but this just heightens the experience, and we have a wee touch of smoke later in the development going into the finish. The warmth fades, and brings a medium length finish, with a touch of wood char fading into layers of sweet vanilla and penny toffees. The creamy texture continues through and demands more liquid to sip. A few drops added. The nose has become even creamier! With some added heather honey. The palate, reflects this enhanced creaminess and is now sweeter, it’s so smooth and delicious in the mouthfeel you can hold it and swirl it around the mouth for absolutely ages. More barley sugar rich now, with some added toffee. Again, I hate overusing the word, but creamy creamy creamy creamy. The previous heat experienced when undiluted is now gone, and we just have more…creaminess and Creme brûlée throughout the late development and finish. A wonderful stable dram. I’m so jealous this is another travel exclusive, but if you shop around the European shores you may be able to find it here and there. 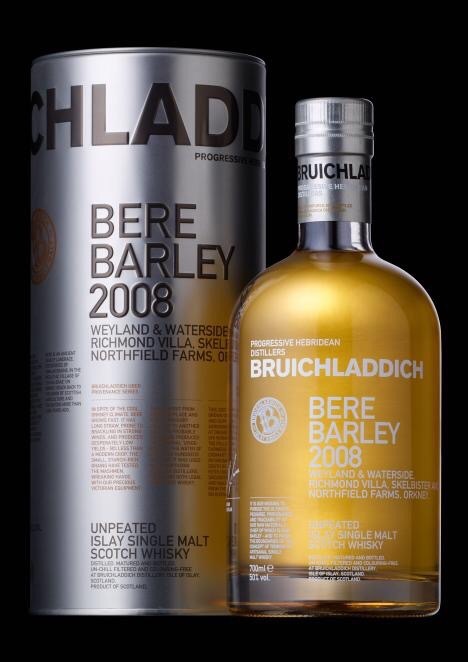 It’s well worth searching out, one of those session drams that will make your evening rewarding after a hard days work. Dry sweetness, very savoury. A meaty nose. Well seasoned beef jerky. Dried dark fruits in the background. Blackberry jam meets rum. Ginger, pepper and a touch of cinnamon covers the spicy bite. Quite an oily and fulfilling mouthfeel on this one. Lots of dark fruits, with the blackberries coming through (complete with brambles coming to mind), thick and jammy. Honey. Sugar cane. Late in the development there are hints of Demerara sugar/rum note. It’s certainly a lot sweeter on the palate than the nose would suggest. A medium to long length finish. Spicy and sweet, with sweet ginger and cinnamon buns with icing. Some rum and raisin, a slight effervescent twang of oak right at the end. With a small drop of water the nose becomes fruitier, with notes of sherry, brown sugar, soaked raisin up front. With some herbal notes in the background. Thyme, clove and a spot of cress! The palate is now even sweeter in the arrival, the mouthfeel still very complete, there is a slight touch of tannin bitterness in the late development. The finish is more rounded but slightly shorter. I’m a big disputer of the way Mortlach has been re-imagined for its official bottlings. I dislike quite a lot about the presentation (ABV, chill filtration, colouring, bottle size, price point), and feel so much more could have been done to present this liquid with higher quality presentation. However…that being said…I like this whisky. It’s lovely, easy drinking, moreish, and I can see what they were trying to do in its appeal, it’s proposed audience, and for that it does a good job. For me It’s a bloody tasty, enjoyable dram. Although. Too expensive. 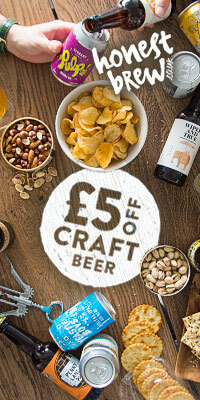 If you find it on offer, it’s worth a gander. From my own collection, bought on an Amazon lightening deal at a reasonable discount.